Food can be non-intuitive if you eat mindlessly. When you fall into a rut with your daily cooking or if you never venture out of box or frozen food from the store or are always eating out in restaurants sort of like they are your dorm cafeteria, you miss an opportunity to hear what food has to say to you. When you are bored with cooking or what you have been eating, its your body’s way of telling you that its well past time to wake up and pay attention. What better way to wake up the mind and mouth than with the deep mind-awakening transformation that can happen when you eat a cuisine that has spent 1,000s of years intensely focused on the information within food and how our bodies respond to that information. 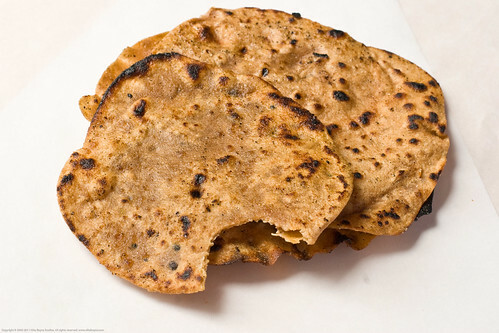 Indian cuisine is not just something you buy off an all-you-can-eat buffet line in an indian food restaurant, in a building which had once been a Supercuts or a pet store or a shoe or eyeglass store in a forlorn strip mall somewhere near your work. Its food that can be made at home and it can bring you great satisfaction, not only on the palate but also a sense of accomplishment as you broaden your food knowledge and choices. When you cook from the Indian Cuisine universe you get to enjoy the perfume and alchemy that happens as you cook with spices and then you get to sit down to food that will not only fill your belly but enliven the rest of your being from your toes, to your chest, to your sinuses, to your imagination. 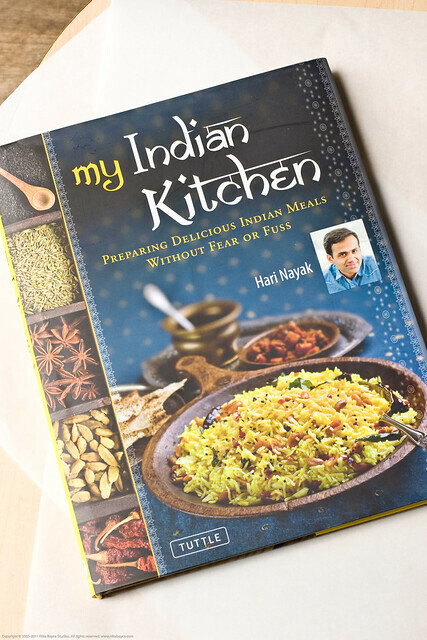 A good place to start is with a resource that will guide you to the irridescent pools of Indian spice magic at home; start with Hari Nayak’s new cookbook “My Indian Kitchen: Preparing Delicious Indian Meals without Fear or Fuss“. 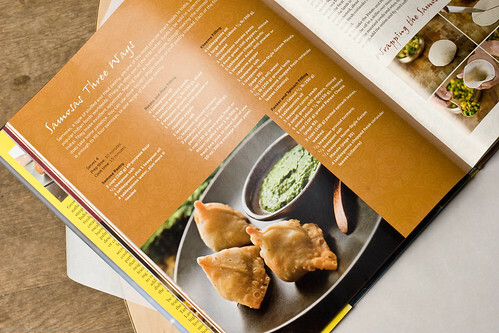 Chef Nayak’s books are always visually mouth-watering and the recipes are approachable, authentic, and delicious. I reviewed another of his books previously – “Modern Indian Cooking by Hari Nayak and Vikas Khanna“. He has worked at famed New York restaurants like Aquavit and Daniel, has just opened the Soul & Spice Restaurant in Kuwait, and owns the Orissa restaurant in Dobbs Ferry, NY. These are just a FEW of the many things he has going on, very busy guy. You can see a video trailer for the book here. I decided to give a couple of more mainstream recipes a try in this book to help gauge how well it enables the average non-Indian cook to prepare favorite treats. 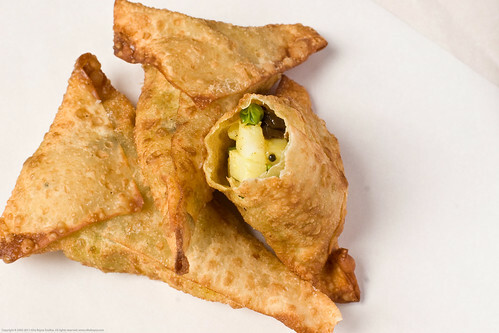 I made the most delicious potato and pea samosas (page 58) and found it to be very simple. Nayak provides plenty of guidance on how to make the samosa dough from scratch and then how to form these pockets of goodness. 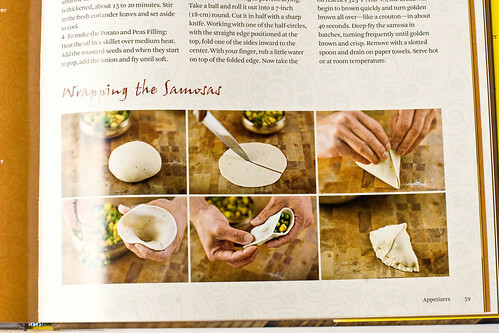 My photos show a samosa made by a shortcut – using wonton wrappers. You can use either method with great success. My family completely enjoyed these, they were gone as soon as they cooled. 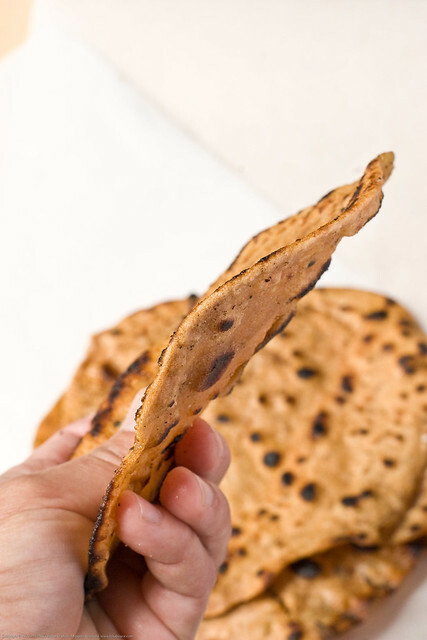 I also made another favorite, roti, chapati, or parathas (these all vary a bit but are similar in shape and all can be made with an infinite variety of additions/secret touches). This recipe could NOT have been any easier and the result was simply delicious. 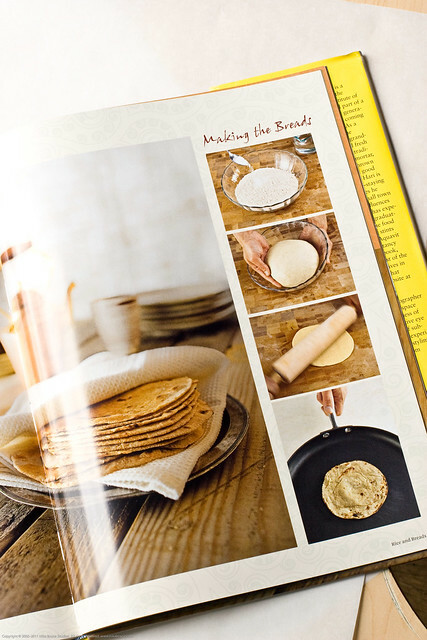 Again Nayak provides a lovely illustrated guide to making these griddle cakes. 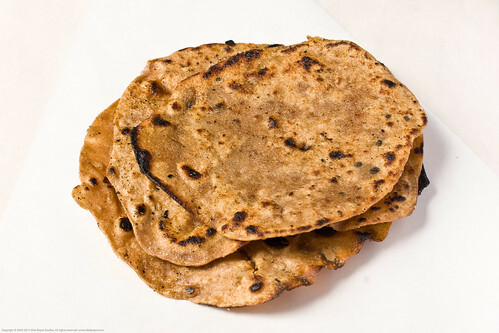 These too were eaten by my little kids as soon as they had cooled enough. How to create an Indian/Bollywood-themed cocktail party with his bruschetta recipes using Indian flavors for a twist. Diwali, the festival of lights, celebrated from Wednesday, October 26 through Sunday, October 30 this year. Hari can explain why it is an important holiday in the Indian culture, how it is celebrated and what food traditions are associated with it. I have really enjoyed this cookbook and I look forward to more of Hari Nayak’s books in the future! Its my hope that you will get an opportunity to give this book a try, I highly recommend it.